Body : All-steel front spoiler with splitter; front and rear track widened by 8-inches; Trans-Am-style wheel arch extensions with aero rocker box design; rocker extensions between arches; rear air dam with diffuser. Rear wing : Trunk lid-mounted with carbon-fiber aero end plates. Brakes : Brembo 14x-inch vented rotors (fr), 13x1-inch vented (r), Six-piston Brembo calipers with Ferodo DS3000 high-friction pads. LAS VEGAS, Nevada, November 5  Jaguar North America is today unveiling a dramatic Racing Concept version of its all-wheel-drive X-TYPE at the 2002 Specialty Equipment Manufacturers Association (SEMA) annual trade show. The bold, race-inspired concept has been developed to test the potential of Jaguars X-TYPE sports sedan as a project car for the enthusiast market, as well as continuing to explore options for Jaguar racing in North America. Paul Gentilozzis Rocketsports Racing was a natural choice for the project. The team competes in the Trans-Am Series for the BFGoodrich Tires Cup using a Jaguar XKR-bodied racecar, and has considerable experience in racecar fabrication and development. 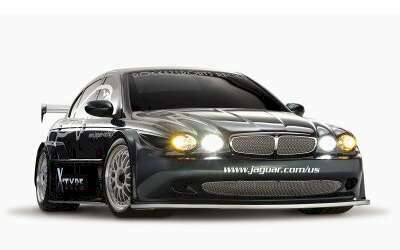 "We used the principles wed learned creating our XKR-bodied Trans-Am cars to create a racing X-TYPE. This aggressive wide-body look also reflects a growing number of the project cars coming out of the import car scene," explained three-time Trans-Am champion Gentilozzi. Rocketsports team of racecar engineers began by widening the X-TYPEs track by over eight inches and fitting three-piece, center-lock BBS wheels. These 18-inch race alloys are similar to the ones the team used on its XKR during Februarys Rolex 24 Hours of Daytona endurance race when Gentilozzi won his GTS class. They are fitted with the latest Michelin Pilot race tires, with a 345/18-section at the front, 385/18 at the rear. Modifications to the body included the addition of race-style wheel arches joined longitudinally by aerodynamic rocker box sections. At the front, theres a deeper spoiler incorporating a lower splitter, while at the rear a full-width, racing-style wing is mounted on the rear deck. Rocketsports also fabricated a new exhaust system, featuring dual pipes emerging from each side of the rear. The X-TYPEs production grille openings and headlight locations were unaltered for the concept. However, to stay true to Jaguars R-Performance styling cues, the upper and lower front grilles use a chrome mesh similar to that used in the supercharged S-TYPE R, XJR and XKR models. 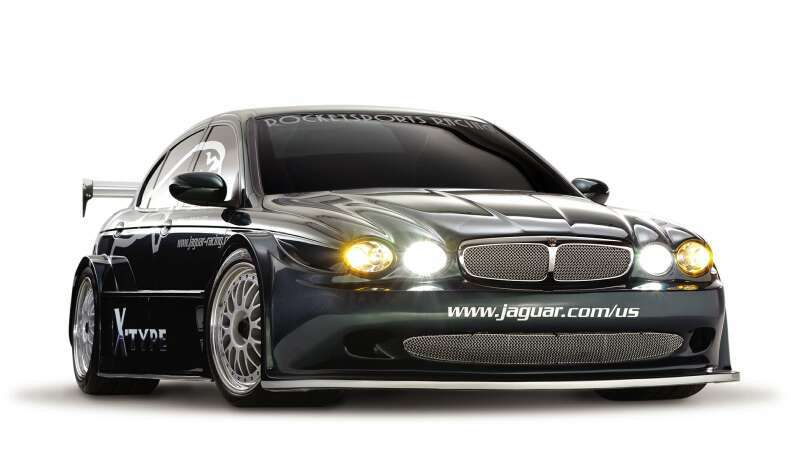 To complete the dramatic appearance, the concept is painted Jaguar Racing Green, a new color for all 2003 Jaguar models. And along each side, silver Jaguar leaper graphics echo those used on Rocketsports Racings XKR race cars. "Much of the styling and technology on display at SEMA is derived from that of racing cars. By showing the X-TYPE Racing Concept, we hope to demonstrate to customers and high-performance component suppliers the potential of the X-TYPE, both as a racecar and as a platform for aftermarket tuning," added George Ayres. During the Racing Concepts appearance at the SEMA show, special video units mounted inside the car will project footage of Jaguars racing heritage on to the inside of the windshield. It is the intention of Rocketsports Racing to engineer this car into driveable test car in 2003 sourcing appropriate components from the after market. The X-TYPE Racing Concept will be on display at the 2002 trade-only Specialty Equipment Manufacturers Show (SEMA) at the Las Vegas Convention Center Nov 5-8.